Combine sugar, flour and salt in the top of a double boiler, stir in milk. Cook over boiling water, stirring until thickened. Beat egg yolks and gradually stir into hot mixture. Return to double boiler; cook 5 minutes, stirring constantly. Remove from heat, add vanilla. Line one quart casserole with Bud's Best Vanilla Wafers and top with sliced bananas. Pour portion of custard over bananas. Repeat, ending with custard on top. Beat egg whites stiff but not dry. Gradually add 1/4 cup sugar and beat until mixture forms stiff peaks. Pile on top of pudding. Bake in preheated 425 degree oven for 5 minutes. Serve warm or chilled. Makes 7 servings. Crush cookies and set aside. Cream together cream cheese, butter and powdered sugar. Add crushed cookies (save some cookie crumbs to use as topping) to creamed mixture. In another bowl blend milk and pudding mix until smooth and add Cool Whip. 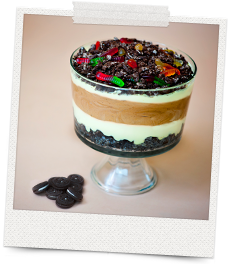 Using a new plastic flower pot or glass bowl, alternate cookie mixture and pudding mixture layers and top with the remaining crushed cookies (it should look like dirt on the top). Chill. When ready to serve garnish with silk flowers to look like growing plants or with gummy worms. In a bowl, dissolve the gelatin in the hot water. Add the sugar and lemon juice. Mix well and chill until congealed slightly. Beat the chilled milk at high speed until very fluffy, adding the salt while beating. Slowly fold the milk into the slightly congealed gelatin until well mixed. Line a 9x13 inch pan with the vanilla wafers. Turn the gelatin mixture into the pan over the wafer crumbs and chill thoroughly and cut into squares. Combine condensed milk, eggs, sugar, vanilla extract and whipping creme together in a mixer until thoroughly blended. Pour into a gallon ice cream freezer, add crushed cookies, and then pour milk to within one inch of the top of the freezer. Turn on ice cream freezer. Makes 1 gallon of very smooth and delicious ice cream. Combine cookies, butter and brown sugar in bowl; firmly press mixture evenly in bottom and 2 inches up sides of a lightly greased 10-inch pan. Bake at 350 for about 12 minutes. Set aside. Beat cream cheese until creamy. Gradually add 1 1/4 cups sugar. Add 1/3 cup whipping cream, flour, 1 teaspoon vanilla, and add eggs one at a time. Pour 3 1/2 cups of batter into prepared crust. Top with crushed Caco cookies, pour in remaining batter. Bake at 325 for 1 hour and 15 minutes. Combine sour cream, 1/4 cup sugar, 1 teaspoon vanilla, and spread over cheesecake. Bake at 325 for about 7 minutes. Turn oven off, leave cheesecake in oven with door closed about 45 minutes. Remove from oven and let cool. Cover and chill about 8 hours. Remove sides from pan. 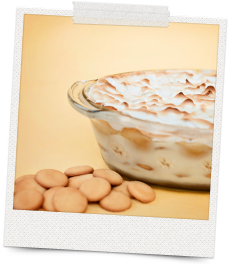 Combine 1/3 cup whipping cream and semi-sweet chocolate morsels in a saucepan. Stir over low heat until chocolate melts. Stir in 1 teaspoons vanilla. remove from heat. Carefully spread mixture over cheesecake. Place cheesecake in refrigerator. Garnish top with crushed Caco cookies. 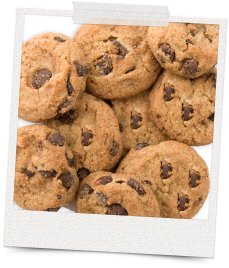 1 6 oz bag of Bud's Best Chocolate Chip cookies. 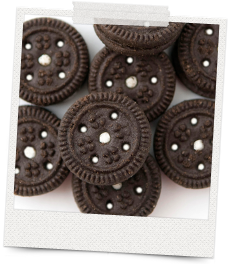 Dip each cookie in milk and then place in bowl, making first layer of cookies. Add a layer of Cool Whip. Continue to layer cookie and Cool Whip until you run out of cookies. Top layer should be Cool Whip. Sprinkle with cookie crumbs. Let set overnight so that the cookies will become soft. Mix cream cheese and sugar; add vanilla and beaten eggs. 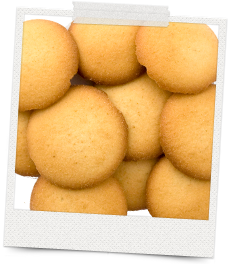 Turn round side of wafers down in bottom of mini muffin cups, place in mini muffin pans. Spoons cream cheese mixture into cups until full. Bake at 350 for 20 minutes. Cool, refrigerate or freeze. In a bowl, whisk milk and pudding mix for 2 minutes. Stir in the pumpkin and pie spice. Let stand for 2 minutes or until soft-set. Set aside three gingersnaps: crush the rest. Fold whipped topping into pudding; spoon into dessert bowls. Sprinkle with cookie crumbs. 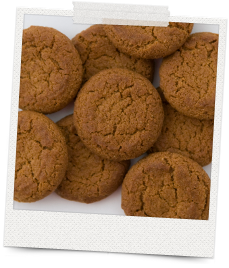 Serve with whole gingersnaps. Yields 3 servings. Preheat oven to 350. Lightly grease 9 inch springform pan. For crust: Combine cookie crumbs, granulated sugar and butter in medium bowl. Press onto bottom and 1 inch up side of prepared pan. Freeze for 5 minutes. For cheesecake: Beat cream cheese, granulated sugar and brown sugar in large mixer bowl until creamy. Beat in pumpkin, Nestle Coffee-Mate and eggs. Add cornstarch and cloves; beat well. Pour into crust. Bake for 65 to 75 minutes or until edge is set but center still moves slightly. For topping: Combine sour cream, granulated sugar and vanilla extract in small bowl; mix well. Spread sour cream mixture over surface of warm cheesecake. Bake for an additional 5 minutes. Run knife around edge of cheesecake. Cool completely. Refrigerate for several hours or overnight. Remove side of springform pan. Serves 16.